I’m excited to announce a great learning opportunity coming up next week: a webinar called “Models of Anti-Poverty Ministry.” Sometimes, churches have a hard time explaining how or why the ministries they do in the name of Matthew 25 took the shape they did. Having tools to clearly name and evaluate “the why and how” behind a ministry can strengthen it tremendously. 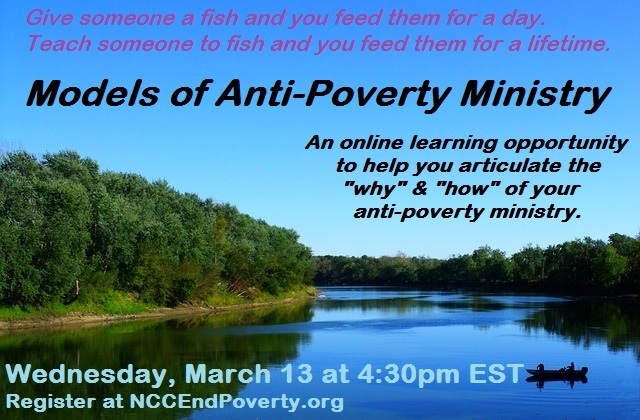 On March 13 at 4:30pm EST, join in deepening your understanding about roles of a congregation’s anti-poverty ministry in a community. Click here to register. The webinar presenter Tronn Moller of Faith and Community Development Institute will share insights on the practices and impacts of a congregation’s anti-poverty ministry. Tronn’s presentation is rooted in years of experience coaching clergy and lay leaders in confronting poverty in their communities. Afterward, participants will have an opportunity to think together about how a congregation in Durham, North Carolina that wants to start a new anti-poverty ministry could discern what next steps to take in their planning. I hope you can join us for this engaging online learning opportunity. I hope to see you online next Wednesday! Register here.